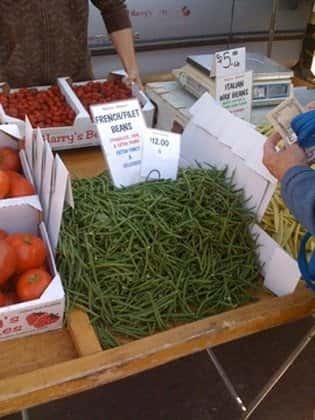 Rick’s hard work at Harry’s Berries has paid off and we will soon have more of our favorite vegetable, the skinny French green beans (haricots verts) pictured below. They are simply wonderful, sautéed in butter with thinly sliced shallots. We treat ourselves to them almost every night when they’re available! You’ll want to, too. The strawberries are incomparable — if Harry’s Berries is out, well, we are too. The only strawberries we serve at Sly’s. Lauri, at the Farmer’s Market, affectionately known as “Mama,” has done it again with this winter’s favorite vegetable, the Brussels sprout. From her family farm up in Arroyo Grande she supplies us the best quality sprouts we’ve had. After a chill and a frost, they’re even sweeter, and better. We cook them two ways at Sly’s: the traditional whole heads, simmered and served with a julienne of carrots and a little butter, and as the outer leaves. The leaves are strikingly different — we blanch them and sauté them quickly in Corto extra virgin olive oil with a hint of garlic. The result is something that even non-Brussel Sprout lovers enjoy. Just more rewards from the Santa Barbara Certified Farmer’s Market. Lauri’s specialty is homemade jams and jellies — and boy are they good. We have Mama’s Mint-Rosemary jelly available at Sly’s for our rack of lamb. The berries, from Harry’s, Lauri, Chuey, and the other Farmer’s Market vendors are still marvelous — blueberries, lucious plump blackberries, and local raspberries, too. Not to mention Harry’s incredible Gaviota and SeaScape strawberries with their heady perfume. Rick tells us that the strawberries will only get better. We know enough to believe him — he’s always right.